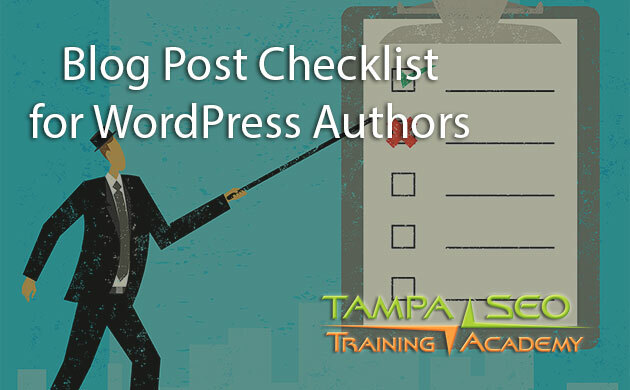 On September 26th, 2015 at 9AM, I delivered a presentation titled “Blog Post Checklist” at the 2nd Annual WordCamp Tampa. This blog post is an example of all the items discussed in the checklist, as well as providing all the slides to those in attendance and those who were not able to attend. Internal Site Search. What are users on your site searching for? Are they finding it? If not, a perfect topic has appeared. Google Search Console. Find out what keywords you’re getting impressions for, but could be ranking better. You’ll be surprised what you can improve. First, write the post without SEO in mind. This will help you focus on the topic and your users so you can get the most valuable information down. If you’re not a great writer, don’t have time to do it, or just seem to stare at a blank page for hours, there are a few choices for you. Record your thoughts into a recorder, then have someone transcribe it for you. Now that you’ve written the post, now you can go back and add keyword sparingly. But remember, it should be human readable. This is also your first chance to checking for spelling, grammar, run-on sentences, and clarity. All these certainly matter to your readers and to SEO. Images help provide examples or assist the them or concept of your blog topic. ALT text helps screen readers read to users who are visually impaired. This is not a place to stuff keywords. When appropriate, be sure to credit image creators when possible. There are endless stock photography websites available to you and images with a reasonable resolution tend to be less than $2 each. We’ve been using Dollar Photo Club, which is now Adobe Stock for quite sometime with great results. Usually your Blog Post Title will be your H1. So don’t add another. There should only be 1 H1 on each page. Find and link similar content on your site to and from your new blog post. This keeps readers on your site longer if they click on those links. Double-points if you use keyword-rich anchor text. Example: WordPress SEO Basics. That link will take you to a presentation I’ve done previously on WordPress SEO plugin by Yoast. Internal linking is a under-appreciated way of helping users navigate through deeper sections of your website or to point them to other content you’ve written previously. Take time to go back to your previous blog posts and pages to find internal linking opportunities. Also known as external linking. This is a great way to pass credit on to source that you’ve used or to blog posts that triggered you to write a blog post. Be sure those links are opened in a new tab/window. Use “Open Link in a new window/tab” in WordPress’s editor. Or if you’re HTML savvy, just add rel=”_blank” to your anchor tag. Linking externally can help you be a credible source of information to your readers. But be careful, linking to poor websites or untrustworthy websites can harm your SEO and your credibility. The category feature in WordPress, and tags, tend to either be under-used or abused. I recommend that you find one category that your blog post belongs to and add it there, and it should be the best category for your blog post. Think of categories as chapters in your non-fiction book. Consider re-structuring your categories to have a more concise structure. I’ve done a presentation about categories and tags before. There’s an example of internal linking. Don’t duplicate or provide too many variant tags. It reduces the effectiveness of the phrases and becomes confusing at a certain point. Tags are about organizing and describing your content, not stuffing keywords. Think of tags as items in the index of your non-fiction book. Most theme use the featured image function very well. They typically appear at the top of your blog post and as thumbnails in category and tag archives. Featured images become the visual poster for your blog post and catch the reader’s eye. Find out the best width and height for your theme and stick to it. Social media networks use the featured image as the image of a post in most cases. Trust me, you’ve missed something. Read your post backwards, you’ll find more mistakes that way. Keep your keywords as close to the beginning as possible. Keep it short and make it irresistible. In most cases you don’t have to do anything. Your WordPress installation will take care of this for you. You can view or change your permalink settings in your Dashboard > Settings > Permalinks. Warning: changing your permalinks can result in 404 errors if permalinks are not redirected properly. Yoast SEO will remove Stop Words (a, the, in, at, etc.) from your permalinks. Sometimes this is fine, other times it might not be depending on your niche. You can disable this by going to Yoast SEO > Advanced > Permalinks > Remove Stop Words from Slugs. Personally, I like keeping stop works in permalinks. We know exactly what this page is going to be about. Google can read this better too! If you don’t write one, Google will find an excerpt from your content and display that instead. You may not like it. First, Yoast likes to call the Title Tag the SEO Title. Yes, your Title tag or SEO title can be different from your blog post title. There is no specific character length or minimum or maximum to follow. Instead it’s about pixel length. But we recommend between 50-70 characters. Include your primary or focus keyword as close to the beginning as possible. Do not stuff keywords in your content to simple increase the amount of times your keyword appears. Write special headings and descriptions for Google+, Twitter, Facebook in Yoast SEO. You should consider uploading featured images that are designed for those networks too. These networks all have different demographics, and you should cater to them. Yoast SEO’s social sharing feature really helps you control the message and help users share it. Use a plugin to automatically share your posts. Automatically tell your loyal readers and email subscribers about new content. Use WordPress’s built-in preview function. How does your blog post look on the front-end? Catch anything wrong? Fix it! Hit publish or schedule your blog post. Contact other bloggers and let them know about your new content.